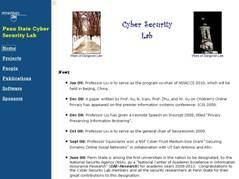 The Cyber-Security Lab performs original researches on a variety of important topics including self-healing systems, trusted recovery, malware, intrusion detection and prevention systems, privacy protection in healthcare, network security, adversary models and game theory, and cyber defense situation awareness. 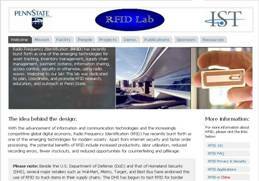 The RFID lab was established in October 2006 to conduct a broad-based research on various aspects (technical, managerial, economic, social and legal) of RFID development and implementation. This lab has been dedicated to plan, coordinate, and promote RFID research, education, and outreach at Penn State. Researchers at the Privacy Assurance Laboratory aim to bring together the inter-disciplinary research on a diverse set of topics related to understanding and assuring information privacy. PAL research seeks to better understand the dynamic and dialectic nature of information privacy through a combination of theoretical, technical and empirical research efforts. PIKE (Penn State Information, Knowledge, and Web) group studies various research issues including: data cleaning and mining, data privacy and security, XML data model and schema/query languages, web search, web services and semantic web, digital library, citation analysis and bibliometrics, and multimedia information system.